Kolokythopita (pronounced koh-loh-kee-THOH-pee-tah) in Greek Κολοκυθόπιτα is a compound word from “kolokythi” (squash) and pita (pie). This Greek savory pie is made with butternut squash and fresh xinomyzithra, a cheese from Chania, Crete. I have been seeing so many pumpkin recipes popping up everywhere in the blogosphere and with Halloween coming up soon I thought to share these recipes with you in case you wish to make something different this year. When I went to the farmers’ market a couple of weeks ago, I bought a hug piece of pumpkin about four kilos. After making this pie, I also made Kolokotes (a Cypriot pastry with pumpkin) and used it to make Veal in Dark Beer with a Sweet and Sour Pumpkin Sauce. To make this new recipe apart from butternut squash and xinomyzithra, I flavoured it with fennel and I added the rice to absorb any juices from the pumpkin, as I do with kolokotes. Xinomyzithra is a low fat Greek cheese and it is not salty. It has a slightly sour taste and it pairs wonderfully with the sweet pumpkin. If you cannot find fresh xinomyzithra you may substitute it with a mixture of anthotyro and feta. This pie gets better, if there is leftover, the next day. To warm it up, I just put it on the toaster but without the upper plate pressing the pie. This pie was made with homemade phyllo but you can certainly make it with store bought phyllo. Use more sheets of phyllo (follow the instruction given in my recipe for Spanakopita) brusing each sheet with olive oil. See step by step instructions how to make phyllo or if using store bought follow instructions given here. Grate the pumpkin and add myzithra, fennel, olive oil, rice, salt and freshly ground black pepper and mix well until the cheese becomes like cream. Brush your baking tin with olive oil. Make the first phyllo bigger than your baking tin so as to cover the sides of the tin.Brush with about two tablespoons of olive oil and proceed with the second phyllo. Do no brush the second phyllo as the filling is added. Add the last phyllo, cut the edges and join the phyllos together by pinching and twisting them to stick together. Brush with olive oil on top. Score the phyllos with a sharp knife to form the pieces and sprinkle some sesame seeds on top. Bake in a preheated oven, to 180 οC for about 1 hour and 15 minutes or until it is golden brown on top. Remove to a wire rack to cool for about 15 minutes before serving. At the end of making the pie there was some leftover phyllo from the bits and pieces cut, which I rolled out into another phyllo and made a few pischies, with honey. Today is a National Holiday, as we are celebrating Ochi Day. To all my Greek and Cypriot friends and readers “Chronia Polla”! Veal in Dark Beer with a Sweet and Sour Pumpkin Sauce. Ivy, this is a very special pumpkin pie! I don’t think I have ever had any savoury pumpkin pie. Thanks for the detailed instructions and pictures on making the crust. This looks yum. 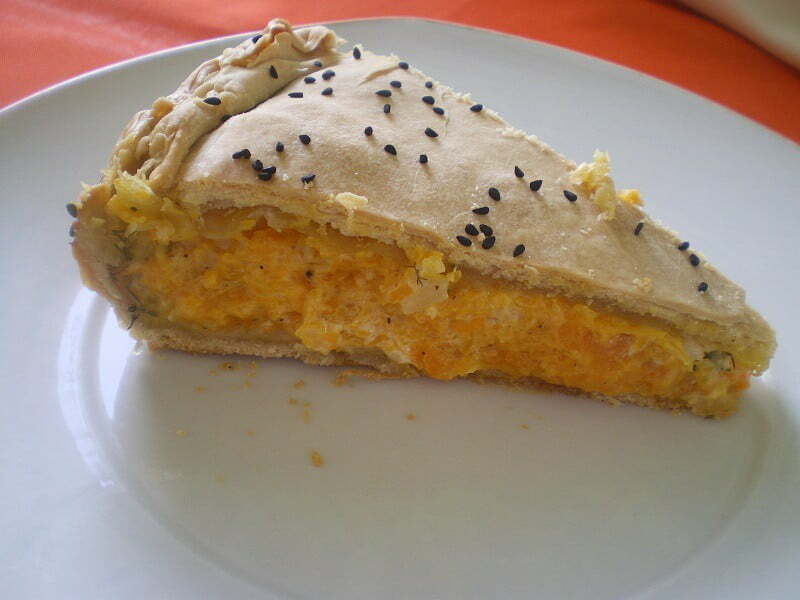 I was recently looking for a savory pumpkin type pie without satisfactory results. I look forward to trying this one. I might use my favorite oil pastry for a change of pace. oops I didn’t read the recipe closely enough. This oil pastry sound intriguing, so I’ll be sure to try it. hi,ivy,a beutiful and tasty pumpkin pie…i love pumpkin pie,because my grannie did it often in advent!my childhood it’s full of pumpkin flavours !thank you for remind me! That pie looks so good! I love pumpkin when used the savory way! Greeks do know to make pies … I never ate pumpkin pie savoury but looks like something new to try Ivy! Funny, I just bought this big about 3 kg banana pumpkin (I love pumpkin BTW) and it’s season too … I made pumpkin cake and breads … but now going to try this … and love your pastry too with olive oil. I only use that now … no more butter! The pischies look interesting too … will try this as well! Here everyone loves syrupy honeyed cakes!!! PS did you fill the pischies pastry with the pumpkin or mix it in the dough? I would really like to try this Ivy! I love kolokythopites … and this one looks delicious. Love the myzithra and the crust with black sesame seeds looks great. Heni, Pischies is just phyllo, olive oil, cinnamon and sugar. Chronia polla à toi aussi, ce kolokythopita est superbe ! Ivy, ta tarte m’a l’air excellente. Tu proposes de faire la pâte qui est une pâte à philo. Aurons-nous le même fini avec de la pâte à philo achetée? Ta pâte a l’air plus épaisse. les pischies me plaisent énormément. Merci Nadjibella. Il est très difficile de parvenir à un filo mince comme le philo achetée. Phyllo fait à maison est plus épaisse que cette achetée, mais vous devriez l’essayer car il est mieux. I would very much like to learn to make phyllo dough. I resist the idea of buying it ready-made. I love the ingredients in the pie. Myzithra is in my list of cheeses to make. Your pie looks just wonderful. Ivy the thing you sprinkled on the pie ( the sesame ) that looked exactly like the nigella seeds. What a flavorful pie. The pumpkin and cheese filling with fennel sounds fantastic! I like the black sesame seeds on top too. Looks great. I love the sound of a savory pumpkin pie! I just bet it’s delicious mixed with cheese and flaky phyllo. I’d love a slice of this pie Ivy – I adore pumpkin, and the phyllo pastry means that it is not naughty from a dietary perspective. I’ve never had this version of kolokythopita. My mother used to make it with stafides and rice (I think)…the cheese is a nice addition. Thank you for sharing! Ivy, this sounds so original. Have never heard of a pumpkin pie with cheese. I don’t think I can manage to roll out the filo but do you think I can make it with store bought filo and if I don’t find any of the Greek cheeses, with what can I substitute it? Lisa, certainly you can use store bought phylo. I don’t know if where you live you can find store bought phylo which is intended for pies and it is a thick phyllo. If not you can use the thin phyllo which is used for making other pastry, like baklavas. Regarding other cheeses my first choice would be feta which is found everywhere which you can mix with ricotta, which is similar to anthotyro (half of each). Many countries have similar soft whey cheeses like paneer or queso fresco etc., although I have never used them so I don’t know the difference in taste. I really like this recipe because I think that the combination of the pumpkin & cheese sounds wonderful. I should try this over the weekend because we’ll be carving pumpkins for Halloween. I hope that you enjoyed your holiday! Ivy, you are so creative! that pie looks so perfect and yummy! I love the idea of a savory pumpkin pie, sounds fabulous! I’m looking forward to your Royal Joust post! This looks great! Pumpkin is not just for sweet pies! This is something I would totally enjoy! Ivy, you took a fab pic of the Kolokithopita…looks very tasty indeed! What a great pie! Very original and simple at the same time. I bet the flavors are fantastic. Great looking pie! Pumpkin works really well in savoury dishes like this. Fabulous. I love homemade pies. The combination of pumpking with misithra sounds delicious.